UPDATE: I am in love with this product! I just returned from a 2 week camping trip in which one area did not allow open fires. I love the Gas One brand dual camp stove. It's 'dual' because unlike most camp or portable stoves that use either propane or butane, this one can use either. Many people already own portable camp stoves, however in all these years, I've never wanted one. I never wanted to haul 'extra' gear with me; space and weight is always an issue when doing any kind of camping. 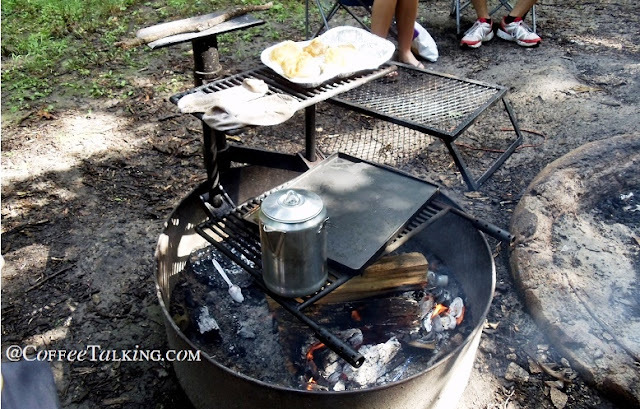 I've also always felt cooking over a campfire is not only true 'camping' but fun. I also never really knew anything about them since I've never been interested. So, what happened to make me change my mind? An upcoming camping trip that includes an area where open fires are not allowed but small cook stoves are. After pondering a few options for food and water during those days I suddenly had one of those light bulb (stupid) moments where I asked myself; "Why in the heck don't you just buy a small camp stove?" It's always been so far off my radar that it didn't even occur to me to want one. But we're going to have our car; we don't have to carry everything in our backpack so a small stove made all the sense in the world! In addition to this, if it's raining or storming the rest of the trip, we'll have an option to boil our water (for coffee!) and cook our food when we can't get a good fire going. The icing on the cake is we will have yet another cooking option at our home in an emergency situation where the power is out. It was time to research and purchase a portable camp stove. And I'm SO incredibly happy and thrilled with the one I chose! I spend a lot of time researching my purchases and I finally decided to go with the Gas One brand GS-3400P Dual Fuel Portable Propane or Butane Camping/Emergency Gas Stove Burner with Carrying Case. It's pretty lightweight, it's pretty sturdy and stable with good quality, it's a cool gold color and best of all it works with EITHER an 8 oz. can of butane or a 16.4 oz. bottle of propane. When you open the case it comes in, you will find the propane attachment stored inside the canister space. To use the stove, remember to flip the pan support over so the supports are facing upwards. It lays flat to store and flips over for use. If you've never used a portable stove before and are wondering how to use the cans of butane - it is EASY and quick. I swear. In the front of the stove make sure the 'lock' 'unlock' level is in the unlock position. Here is a close up showing the small space that is open on the rim of the can of butane that you lay facing up so this little lock level with the spring is setting above it. Now push the lever down to 'lock'. The stove pushes itself into the canister nozzle and seals tight. If it doesn't, you probably forgot to lay the canister with the open space on the rim facing up. Check and try again. Just turn the dial down to the ignite position until you hear and feel it click. At this point the little blue flame will be going on high. Just turn the dial to lower the flame to where you want it to be. If it's an extremely sunny day it might be hard to see the flame so be careful. It burns hot obviously. One of the options sold with this stove on Amazon (where I purchased mine) is a wind screen. To turn it off just turn the dial back to off. Push the lever back to 'unlock' and the canister unlocks and you can lift it out. You can store the propane adapter back inside the unit to store. Flip the burner back over flat to store. And do not store with a butane canister inside the unit. So here is the one I ordered and tested twice - and I love it. No regrets at all - I like everything about it. The case it comes in is pretty thin plastic - pretty cheap I suppose but it's lightweight. I plan to use mine primarily with the hotter burning butane, however, because it can be hard to find in parts of the country and propane is easily found at sporting good stores, Walmart, etc. I am always storing the propane attachment with my stove so if I ran out of butane while traveling I can pick up a bottle of propane and carry on. I bought mine through Amazon but they sell these in many different places. IF you are interested in the dual propane/butane style be sure to read carefully. Most stoves are only propane burning so you have to be sure you are looking for the dual option. The gold colored stove by Gas One is dual. If you can not find butane canister near you, with our GS-3400P you can always use propane cylinder instead or vice versa. My daughter looks like she's doing an advertisement for the food in this picture! She isn't. I just called her name and told her to smile she was holding the food at the time so this 'pose' happened. This morning as I sipped my coffee I was glancing over some of the photos in my camping file for Coffee Talking. I came across one I used on CoffeeTalking not long ago in a post about taking my son and his friends camping one weekend when all we had was torrential rains 95% of the time. 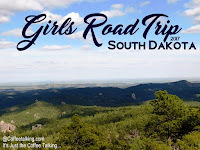 One of our best camp/cooking nights was when one of my daughters and I were in a beautiful state park, with some great hiking trails, incredible rocks and a gorgeous river. This was our first experience in a 'sleep' cabin - opting for it over a tent when we saw they were offered for only about $10 more than a tent site at this particular site. Sparse, 1 room; it offers a bunk bed, a bench and a hook. No kitchen, bathroom, separate rooms, etc. You bring your own sleeping bag and pillow and everything else because it's basically a wood tent with a built in bed frame. It also offered a great deck overlooking the river and one of the trails below. I had bought a camp cook stove for this particular trip because later, we were camping in some primitive areas that in addition to no facilities, also banned all open fires of any type. The only thing they allow in this area was a cook stove. I was 'forced' to change my view on camp cooking and honestly? Thank you God! Ha. Having coffee in mere minutes of waking verses building a fire waiting for it to get hot and brewing coffee in my little percolator was a blessing and a gift on that trip. Especially when the temperatures dipped down to the 20's on that trip - and we were in a lightweight tent. We had a sleep cabin. A private deck. A picnic table and instant heat to cook over. We had such a great night this particular night; every single thing was perfect. It was actually the first night of our 2 week girls road trip in which we went on to tent camp across the state; but for this first night of relative luxury.... we are forever thankful. And yes, a cookstove on this trip earned it's place as a "priority" now when camping. Every evening whether I plan to or not, I end up doing a little more research (in one way or another) into our trip. 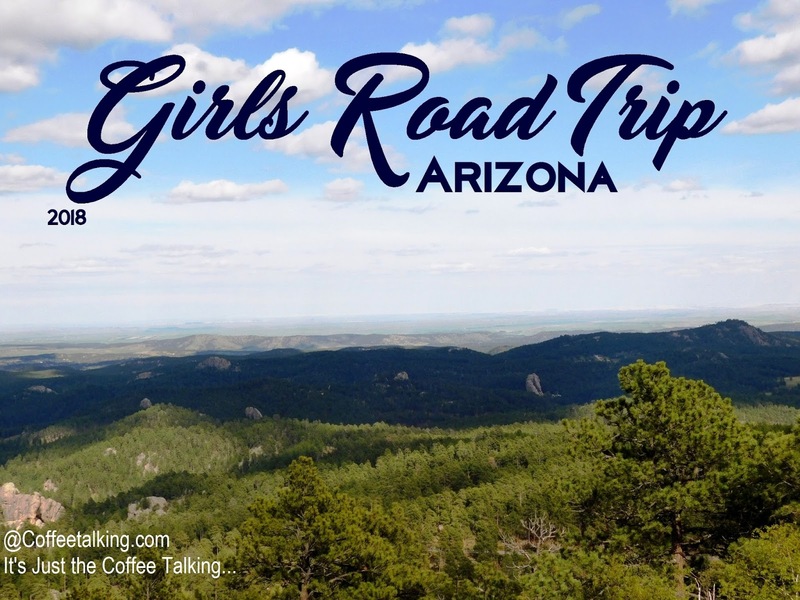 Everyone has different priorities, agenda's and interests when they plan or go on road trips or vacations. For me, I like to know where I'm going to sleep that night. Everything else is icing on the cake, but the cake is knowing whatever the weather, the time frame, running early or late, humongous crowds or solitude... I know I have a place with my name on it to safely lay my head that night. The reason this is a long-research style task for me is that I don't like campgrounds. I don't like crowds. I hate RV's. I don't like noise, screaming, unattended children running through everyone's sites, playgrounds, loud music, late night beer drinking sit around the fire parties, etc. Although I like using an area deemed 'campground', I prefer out of the way, primitive, barely qualifies as a campground for most people type places. No bathrooms, electricity or water? No problem. It means it keeps most people away. I like that. Knowing there are campgrounds with 'first come first served' sites causes me anxiety. I always envision worst case scenarios. We will be driving through a blinding thunderstorm, running late because of the weather, it's 9:pm, pitch black, driving rain, and we pull in to find all the sites full... never mind if the weather report says it's supposed to be 40 degrees and sunny and reviews say the camp usually has sites open that time of year. I also know I can boondock and camp in national forests as long as I'm at least 1/4 mile from a highway/roadway - but for a few reasons that's not going to work for us this trip. So I am looking for tent camping sites that take reservations - even if they are quite primitive. No water, no bathrooms, no electric... no problem. Just make sure it has my name on it. So where am I in my planning for this? I have 3 destinations booked and 1 more reservation mid-week at a 'busy' campground that I only booked because it has pay showers and it may be our only chance at a shower that whole week. Still looking and booking: 2 nights on the way to our first destination and still need 1 night on the way home. It's now later this evening and I have booked 1 of 2 on the way out and got the last one on the route home done! Just need ONE MORE for the way out - and done, done and done. .... just rambling over morning coffee. no other work so noble and so worthy...."
This afternoon I reached a stopping point so of course, what else would I do but to brew a fresh cup of hot, strong coffee and come to the open laptop for a bit to check the latest emails and to scan some news headlines. I don't regularly read any one personal blog or site but today, I somehow ended up lost in that click-then-click-then-click-that-too and ended up on a random blog where the woman had posted a quote by JR Miller. As I quickly skimmed the page I saw nothing of interest on it... except this quote. And then I read it again out loud. And by the time I finished reading it aloud slowly and pondering the words, I had tears running down my face. Where did those come from!? I wasn't expecting to have that kind of reaction but there were so many thoughts running through my brain at breakneck speed as I read this quote. My own babies, grandbabies, how I want to tell my own children how precious every single moment is and to not fuss and yell and get angry over little things, that in a blink they will be grown. The children I see being raised by parents with poor parenting skills, being used as political props at marches for things they don't understand and in many cases, things their little eyes don't need to see! Children harmed by Momma's 'boyfriends'. Children abused by those who love them. Children never read to, never sang to, never rocked for hours or taught nursery rhymes. Children dropped off at daycare at 5:30 am and not picked up again until 6:pm only to be rushed through a drive-thru and a bagged meal tossed at them for dinner, eaten in the car and then sat in front of a tv when they get home until bedtime. Children not tucked in and given a kiss goodnight. Children never taught there might be a higher power, a creator of this world. Children not taught to sing the ABC's and taught to count to 10. Babies left to cry for hours in a bouncy seat in a room alone while the parents party. Babies that never got to gaze into their father's eyes as they lay in his large hands, heads close. Children who have never had a pony ride on Daddy's back or get to 'help' Daddy or Mommy make dinner. Children who don't know the joy of a birthday cake. Children that are taught by age 2 or 3 to 'fight' and swear and use language even adults shouldn't use because their parents think it funny. This week I got a second cell phone (which is a whole other post about how I'm going to test out a Verizon carrier phone verses my Sprint phone to see if the reception coverage is better before I switch the whole family plan over) and before I set it up I wanted to back up my current phone; including my ring tones (photos, contacts, etc) so I could easily keep the same personalized ringtones for my contacts on both phones. That's when I was forced to update to itunes 12.7.2.06 because it refused to recognize my (older) cell phone. I tried 3 different cords as I had read online that was usually the problem when even the newest cord to the newly delivered phone didn't work, I had a suspicion it was iTunes way of forcing me to the latest update. So update complete and.... they stopped letting you manage your ringtones through them. The pop up on iTunes says they want to focus on music and video instead. You can see them on your phone if it's plugged into itunes but you can't sync or transfer them and they've made it more tricky to make them. BUT I worked for a few hours last night to figure out how to still use iTunes to make and transfer the ringtones for my phone(s). I was going to just type out the instructions for myself and see if my daughter wanted them but then a friend was interested as well and I decided to just put it on the Coffee Talking page. It looks like a lot but I swear once you do it you'll get the hang of it and it goes quick and easy. Once you have your song shortened and ready, you can make ringtones in about 2 minutes. I don't know how important this first step is. I've done ringtones about 5 different times now since last night testing it - and I just always had the settings this way... because I've always hated the auto sync itunes always did. I lost a lot of music files over the years as we had many different people in our family plugging ipods and iphones into my computer and it would automatically sync and lose and replace things with whatever someone else had when they plugged it in. When you first plug in your phone, click on your phone image and you'll get this setting page - scroll down past the edge of the box so you can see where they moved the "manually manage" buttons now. Click the manually manage button and if you wish, the 'only songs and videos but don't know that that matters or not) and OK.
You have to start with a song you ALREADY HAVE. So either buy it, upload it from your own CD into your computer and your itunes library, etc. Basically, just get the song you want to use into your itunes library. Listen to your song and watch the little clock on the side of your player. Choose a small portion you want for your ringer; about 30 seconds more or less. Note the time it starts and it stops. Right those down. That's the portion of the song you will use. Click 'SONGS' from the left hand menu. Find your song in the list on the right. Right click and choose the option called "SONG INFO"
Click the box where it says START and type in the time from your song. 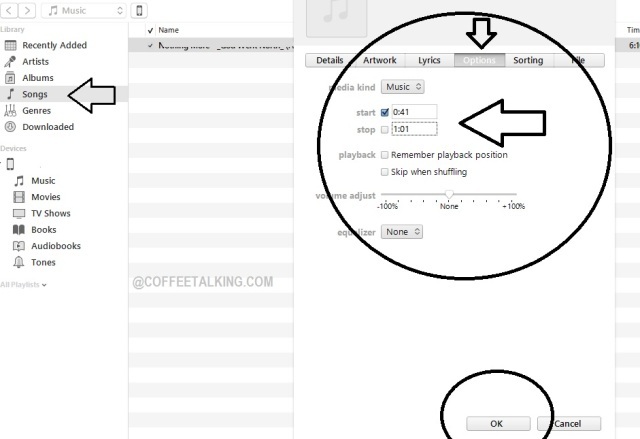 Click the next box where it says STOP and type in the stop time from your song. Click once on your song just to highlight and choose it. Now, leaving it highlighted, go to the left top of the page where it says "FILE" and click. 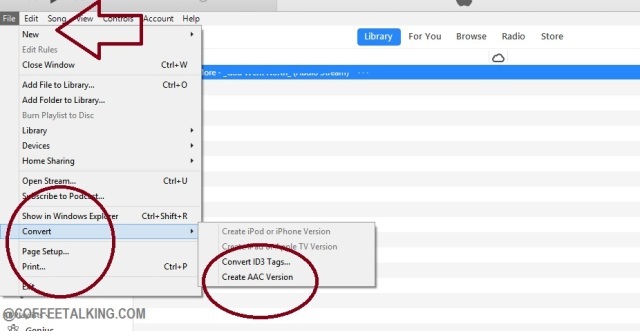 From the options go to "CONVERT" and when it opens the dropdown menu, choose "CONVERT AAC VERSION"
(This will make a copy of your song using the stop and start times you typed in - the copy appears right under your original song and you'll hear a ding when it finishes - about 5-10 seconds). As soon as it dings, go back to the original and change your START AND STOP times back to normal so your song is back to 'normal' length. You don't need it anymore. Now you will just be working with the new 'short' song of about 20-40 seconds you chose to make a ringtone into! 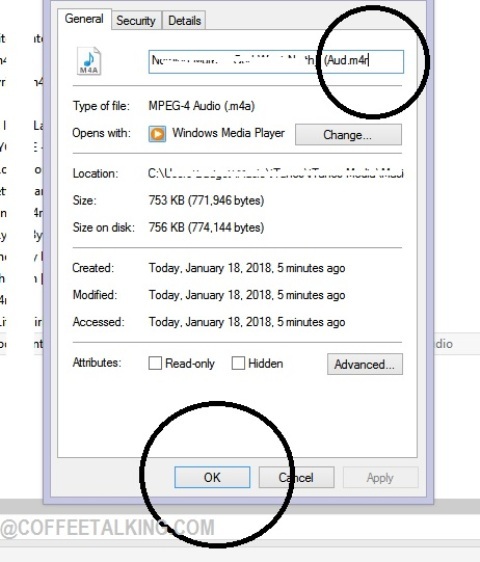 Right click on your new shorter version and choose the option "SHOW IN WINDOWS EXPLORER"
Right click your song from the windows window and choose "PROPERTIES"
You will see your song with an extension of .m4a - change the "a" to an "r"
You will get an pop up notice warning you about changing the m4a to m4r. 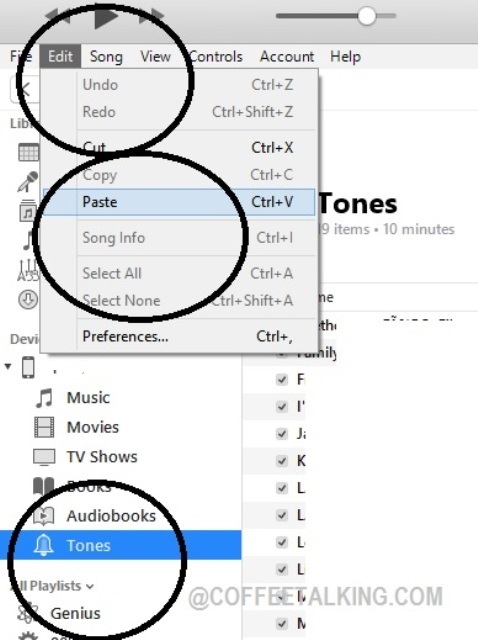 Leaving the windows explorer open on the right, or opening it back up if you closed it out, and looking at iTunes on the left, click to highlight your phones "TONES" option. Back in the windows explorer window where your song/ringtone is listed, right click it and choose COPY. Back to iTunes file/edit/song/view etc. options on the top left and click EDIT, and PASTE. (Right clicking to paste at this point isn't allowed by itunes but you can work around it by this edit, paste option). NOW YOU SHOULD SEE YOUR NEWEST RINGTONE LISTED IN YOUR TONES FILE. And it just put it on your phone without having to officially sync or do any more steps because it's reading your phone - and it doesn't manage your ringtones anymore. Itunes just 'sees' them but no long will sync them for you. (Which is why you cut and pasted it). When you unplug your phone, your ringtones won't be showing up in 'tones' anymore like it used to. Again, because iTunes isn't saving them or syncing them, it's just listing them when you plug your phone in. 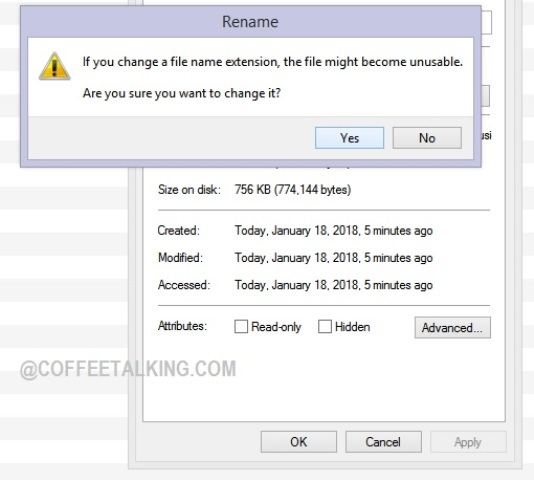 NOTE: I suggest finding the file where they are on your computer (again if you already closed the windows explorer file window - search for them if you have to) and select and copy to a completely different folder for back up. 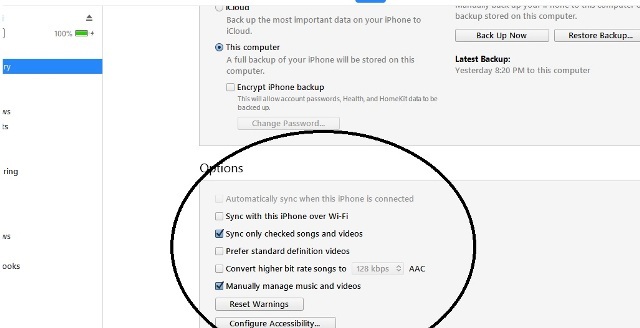 If you mess anything up or your phone loses them during an iphone/itunes backup, restore or sync, then you will need to repeat the step above where you select, copy and then edit/paste back into tones again. I'm not a computer blogger, an iphone blogger, an electronics blogger or work in any sort of industry remotely connected. Please don't ask me technical questions or try to figure out things on your computer. I am posting this partly just as my own personal reference to remember the steps the next time I need/want to make a ringtone.